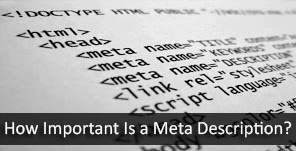 Should You Add A Meta Description For Every Page? A Meta Description is a concise, 170-character description of what a webpage is about. They are commonly used on search engine result pages (SERPs) to display preview snippets for a given page. Beyond that, they're also used on social platforms, and other sharing sites for the same purpose. We know from our general knowledge of SEO best practices that adding meta descriptions is a good idea. But are they absolutely necessary? Should every page on a website have a unique meta description? To be honest, I don't like meta descriptions much myself. It's hard to summarize a descriptive webpage in a few words while still keeping all the major keyword intact. But it has its uses nevertheless. Do it right, or forget it! OK, first thing's first, meta descriptions are not a ranking factor. So sometimes, it is okay to ignore them. Often, there are a lot of pages on a website or blog, and it can be really time-consuming to sit through the process of writing a meta description for each one (not to mention mind-numbing and boring!). So in such cases, it is okay to omit a few pages. What you should not be doing is, writing the same meta description for a bunch of similar pages. I know you may have a lot of pages to go through, and you're eager not to miss your favourite show on TV, or hang out with your friends or family. But if you're gonna do it, do it right. If Google finds duplicate meta description (which it will), your content will be flagged, which might lead to a penalty. Remember, it is fine if a page has no meta description. But if it does, it's very important that the description is unique. Now that we know whether to add meta description to a page or not, it's time to look at what it stands for. You can think of a meta description as a means of advertising. It draws readers to a website from the SERP and thus, is an extremely important part of search marketing. Crafting a compelling meta description using important keywords can improve the click-through rate (CTR) for your webpage. To maximize click-through rates on search engine result pages, it's important to note that Google and other search engines bold keywords in the description when they match search queries. So the more keyword-rich your meta description is, the better it looks to the searcher. Remember that a snippet on a SERP can only show a limited number of characters. Generally, this limit is set to 170 characters. You can add or take away a a few characters, but that's really what you should be aiming for. Lower than the limit means you're not utilizing your real-estate, and higher than the limit means your characters are going to waste. Also remember that the meta descriptions must not have any special characters - not even quotes. Google cuts off any meta description with quotes in it. So if you want your hard work to count, stick to alphanumeric characters. What if you don't add a meta description? Well, in that case, Google will try to impute one for you using your content. Although not optimized, this could do the job most of the times. But since it's an automated system, there might be errors, and Google might pick up the wrong content to show on the snippet. So make a point of checking the meta descriptions for every important page on your site, and make sure it is what you wanted, and not something that looks spammy or auto-generated to a user. Wonderful Posst. Thanks for sharing it. Yes, it is most important on every web pages we should know that if we ignore, Google cannot crawl our web pages. Dear Qasim, Well Said. A Unique meta description is always shows good result. Well said that "Meta descriptions" should not have Special Characters, and better not to exceed 170 characters. But I see that for this Post the Meta Description is 287 Characters and also containing some special characters. Please clarify this..
Hello guys. Any ideas on how to get rid of the duplicate meta descriptions that involve the "?spref=bl" on the end of every Blogger URL? Should i configure it from the URL parameters and hide it from Googlebot? Appreciate your input on this. I think Meta description is very important for site as well as page. Hi Qasim, great post. Personally, I choose to have a unique meta description on every page. It is because I want to maximize every opportunity to increase CTR. Letting Google decide which part of my web page content to put in the SERP snippet does not give me that much control.